So many women honestly don’t know how to wear their clothing MANY DIFFERENT WAYS! They wear it one way, and get comfortable with that, and don’t really think to style it any another way. So I just wanted to share my take on this adorable bomber, styled DOWN! And some think too, that if they have something on the dressy side, that that’s the only way they can wear it. I LOVE to mix, in fact the more mixing things up, the better for me!!! And even though this lacy fabric on the jacket is dressy, it is a bomber jacket after all! So that’s why I loved it with these VERY TRENDY jeans, but still with my dressy white heels!!! The metallic tee I’ve just pulled together and threaded it through my belt loop! And you know I’ll love my pearls forever…..they’re just so girly and everything!!!!! 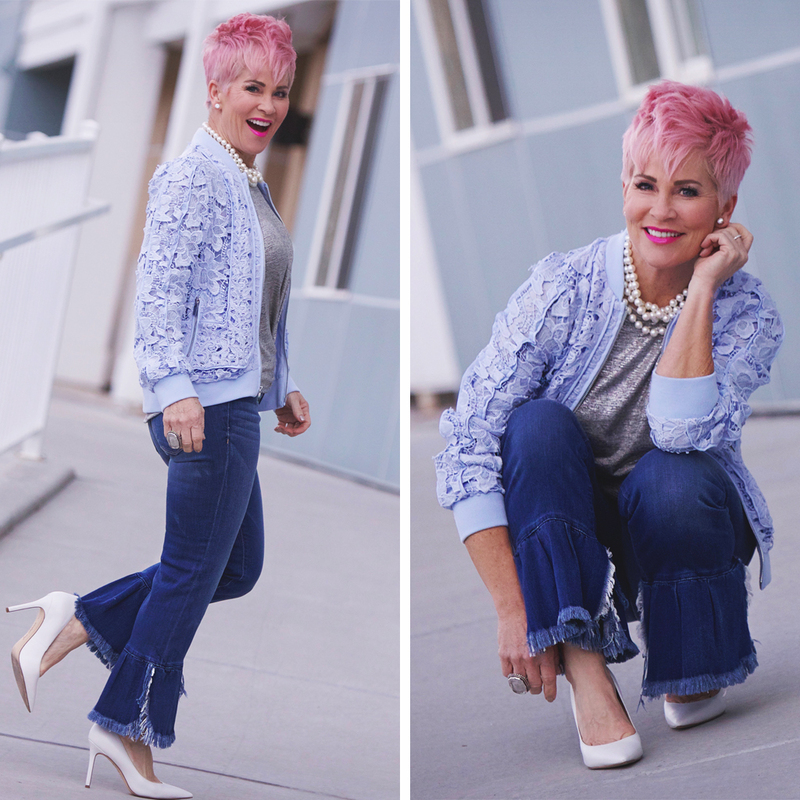 I also wanted to talk about TRENDS….and these jeans are VERY trendy! I tend to love trends! It’s always a really smart idea to NOT spend a lot of money on them. Better to find something that’s more cost efficient, because chances are, next season the trend will be OUT! These jeans are only $65!!! Score, right?!! If you buy, make sure to size down! P.S. I would LOVE to know from you all, if you think I’m writing too many blogs? Would you like it better if I combined my blogs in to one? Would you like it better to get less, or more? I’ve heard different things out there, but I should probably ask the ones that subscribe to mine!!! Thanks so much friends!!!!! I agree with Sharon, you can not get too much of a good thing!! I love checking in on ur blog everyday!!! So if u want to post… I will keep reading! I love your daily blogs! I look forward to them. Your style is impeccable, and I only wish I could put together outfits like you do! I’m 61, but, like you, I don’t act it! I exercise 6 days a week, and am in much better shape than a lot of 25 year olds, so I appreciate your fun style! I recently visited my local Chico’s because of you, lol! I never would have shopped there before. Keep ‘em coming! No, I love reading your daily blogs! So keep them coming please. I look forward to reading your blogs every morning….please continue! Love seeing the trends and the way you combine different styles. 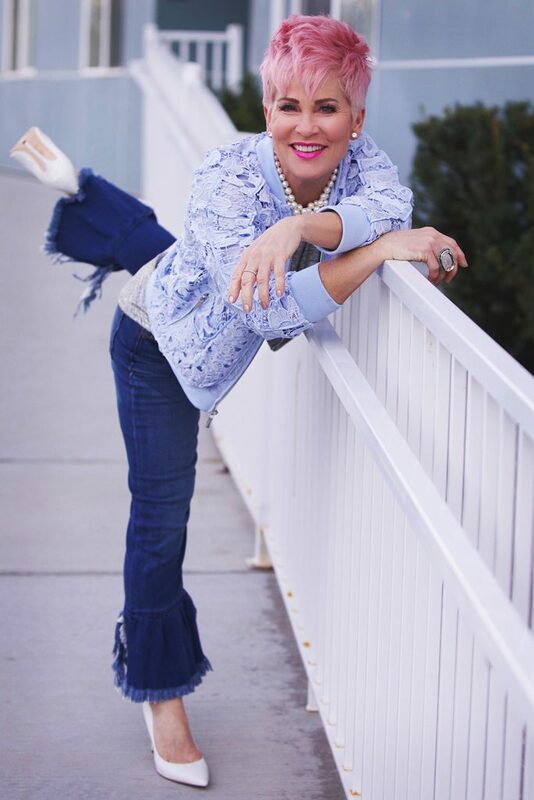 I love your blogs and all your creativity styling with clothes and jewelry! You described the “trendy” jeans as costing $65; but linked us to their home page where they cost $238!! Did I miss something? Brenda….WHAT??? I’m checking that now! Here’s the link again! I LOVE the T Shirt hack! Please keep the posts coming!! I look forward to reading them everyday . THAT BOMBER!!! I so love it, I so want it, keep looking at it online, even with the % off still a little pricey….I know, I know you feature and wear it like a million times in your blogs, wearing it with this outfit and that outfit. Seems like a lacey blue cloud following me around saying “bring me home with you”. Aahhh, it must be a sign, huh? I look forward to your Blog’s everyday Day so please keep them coming daily if you can.Love love you’re Blogs. Going broke shopping.